The loss of a tooth is always upsetting for both the patient and their dentist. Although we do our best to preserve all your teeth, sometimes this is simply not possible or practical. When extraction becomes necessary we will make sure that you are completely informed of the reasons why, the associated risks and your options for replacement of that tooth or teeth. All extractions can be performed in our practice by our visiting Oral Surgeon Dr. Jeffrey Field. He brings 30 years of experience and knowledge to make sure your procedure happens as atraumatically as possible. All of our surgical procedures, including extractions are performed under strict operating room sterility standards for your safety. 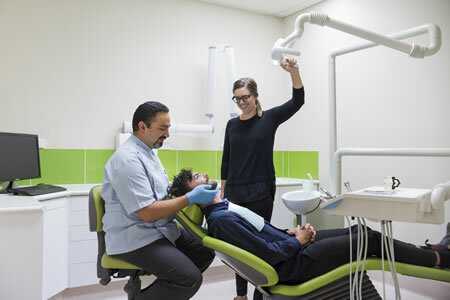 Should it become necessary, you can have your extraction(s), including wisdom tooth removal at Green Apple Dental, under the care of Dr. Field and his experienced team. Is fear of dentistry preventing you from getting the dental treatment you know you need? If so Dr. Jeffrey Field has been providing sedation for dental patients for the past 30 years. He can make sure you are comfortable during dental procedures. Book a free no obligation consultation today to discuss your dental needs.